The Croatian film directed by Nebojša Slijepčević, Srbenka, was selected as the best documentary at the 24th Sarajevo Film Festival, while Leon Lučev won the best actor award for his role in The Load, a Serbian-French-Croatian-Iranian-Qatari co-production (Croatian co-producer – Kinorama, Zagreb), directed by Ognjen Glavonić. Furthermore, Croatian film professionals received awards in the festival’s industrial segment as well. The jury, headed by Leena Pasanen, the Leipzig Documentary Film Festival director, decided that Slijepčević’s film Srbenka deserves the award for its intriguing confrontation with difficult questions from the past. The audience also voted Srbenka the best documentary film with a 4.76 rating. In this film, already nominated for Best European Documentary, Slijepčević explores how Croatia is faced with the irrational circles of hate propagated by chauvinistic prejudices. The story is inspired by the brutal murders of 12 year-old Aleksandra Zec and her parents, committed in Zagreb in 1991 by members of the then Ministry of Internal Affairs reserves, led by Siniša Rimac. The plot then ties itself to a play on this theme directed by Oliver Frljić in a theatre in Rijeka. 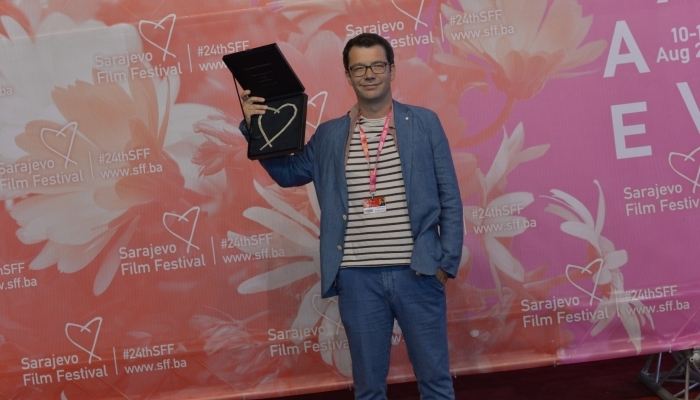 Slijepčević, upon receiving the award, thanked the SFF team for the support given in making these kinds of films but also emphasized that his film would not be possible without the courage of people like Frljić. ‘I am grateful to all the brave participants in this film, starting from Oliver Frljić – one of the most relevant artists working in Croatia, and beyond,’ said Slijepčević. Leon Lučev won the Heart of Sarajevo for Best Actor for his role in The Load. The film also tackles the issues of war crimes and their consequences. Lučev plays a refrigerator truck driver who, in 1999, transports Albanian bodies killed in Kosovo to Belgrade. The Slobodan Milošević regime attempted to cover up traces of ethnic cleansing, and the film offers audiences the traumatic experiences of a person who innocent, and without consent, becomes a co-conspirator in a crime. ‘This was the most difficult film and theme I’ve ever dealt with. It was about being responsible towards people,’ said Lučev expressing special thanks to the film’s director Ognjen Glavonić and the whole team who worked on the film. Iranian director and two-time Oscar winner Asghar Farhadi, head of the jury, announced that the Bulgarian film Aga, directed by Milko Lazarov, was this year’s best feature film. Ioana Uricaru won Best Director for the Romanian film Lemonade, and Best Actress went to Zsófija Szamosi (Hungary) for her role in the film One Day. Croatian filmmakers were also awarded at the festival's industrial segment. In Sarajevo, Đuro Gavran's project One of Us won a DOK Preview at the 2018 DOK Leipzig Festival, including a visit to the Leipzig festival and an opportunity to present. Furthermore, Croatian projects also received awards in the CineLink co-production market. Juraj Lerotić’s project Safe Place won the Eurimages co-production award (producer – Propeler Film), while May Labour Day, by Pjer Žalica, who also co-wrote the screenplay, won the Arte International Relations CineLink Award. The EAVE Scholarship went to producer Tibor Keser for the project Fiume O Morte! directed by Igor Bezinović, a Croatian-French-Slovenian co-production, produced by Restart. The B&H Filmmakers Association awarded Alen Drljević, director of the minority Croatian co-production Men Don’t Cry (Croatian co-producer – Produkcija Živa), and the film’s producer Damir Ibrahimović, the Ivica Matić Award. This year’s SFF presented audiences with a record number of films. Organizers estimate that approximately 100 000 people saw the 266 films from 54 countries which screened at this year’s festival. The 24th Sarajevo Film Festival, held in the capital city of Bosnia & Herzegovina, ran from August 10th to 17th. For more information please visit the festival’s official website.